While this journey includes several multi-night stays, the itinerary is busy with long travel days and many visits, including longer walks in historic centres, often with rough surfaces and stairs, etc. We will visit areas in the West Bank, with political unrest. If required, we will adjust the program to ensure the safety of all our group members. Guests must be active and in good physical condition to fully enjoy the journey. Discover the deep history and sacred sights of Israel and Jordan in this comprehensive 20-day Tour, hosted by two seasoned world travellers, Jim Thompson and Ted Reeve, and guided by top local guides. In addition to exploring ancient civilizations and biblical sites we will engage with modern cultures and friendly people who are living and working towards peaceful co-existence with all inhabitants of the region. You are sure to be moved by the ancient sites, amazed by the diverse landscape and encouraged by people whose mutual respect for each other is inspirational and transformative. Group members gather in Toronto for the overnight direct flight to Tel Aviv. Crossing into Jordan early this morning, we meet our Crossing into Jordan early this morning, we meet our Jordanian guide and coach. We then drive into the desert to Wadi Rum, following the route of the Exodus from Egypt. Perhaps best known for its relationship with Lawrence of Arabia and the Hashemite Bedouin, this region was the heartland of Midian, and played a crucial part in early Israel’s faith. We will take a Jeep tour through this beautiful wilderness before continuing to Petra. Located in the heart of the Seir Mountains, the lost city is close to the traditional burial place of Moses’ brother, Aaron Peak. Entering through the Siq (main entrance) we shall find the lost Rose Red City carved from the sandstone mountains over 2,000 years ago. Accessible only by a narrow gorge (1 km long), the city was rediscovered in 1812. Admire the massive Treasury, the many tombs and temples, all of which were carved by hand. Farther still we will find the theatre, once used to make sacrifices, and the royal tombs. Franciscan archaeologists believe they have uncovered the house of Peter. Then we go on to Tabgha, where the first feeding of the multitude is commemorated and to the Church of the Primacy of St. Peter, where Jesus commissioned Peter to “Feed my sheep”. We continue around the Sea and then back to our kibbutz resort. 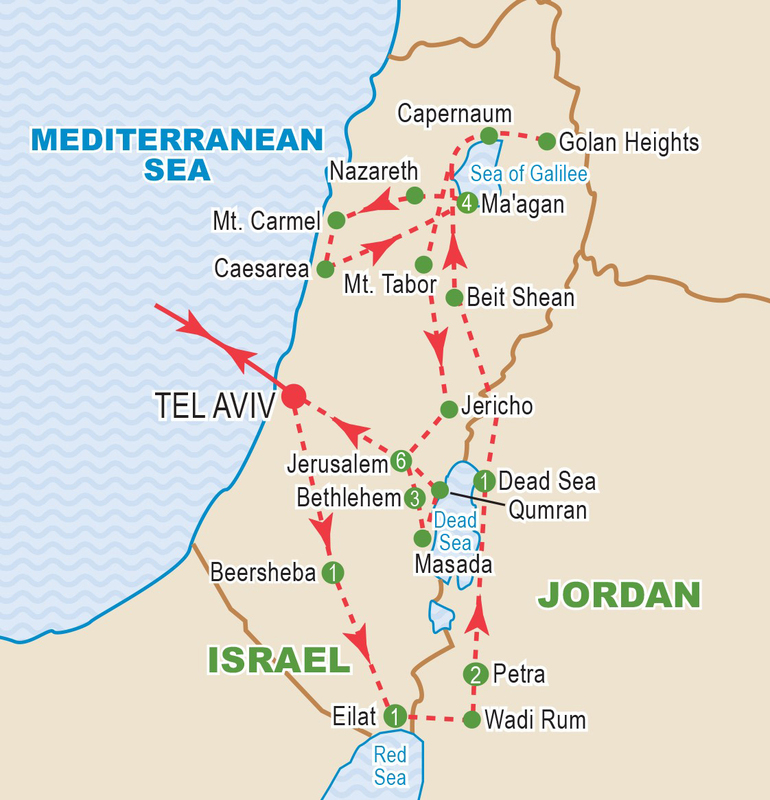 We proceed towards the Golan Heights and stop at Hazor, “the head of all the kingdoms” (Joshua 11:10). At Dan, enjoy a nature walk beside the Upper Jordan visiting the Dan City Gate, the four horned altar and the 4,000 year old Abrahamic Mud Gate. At the spring of Caesarea Philippi (Banias), Peter confessed his recognition of Jesus as the Messiah. Drive to the Druze village of Birkat Ram for lunch and a view of Mt. Hermon. 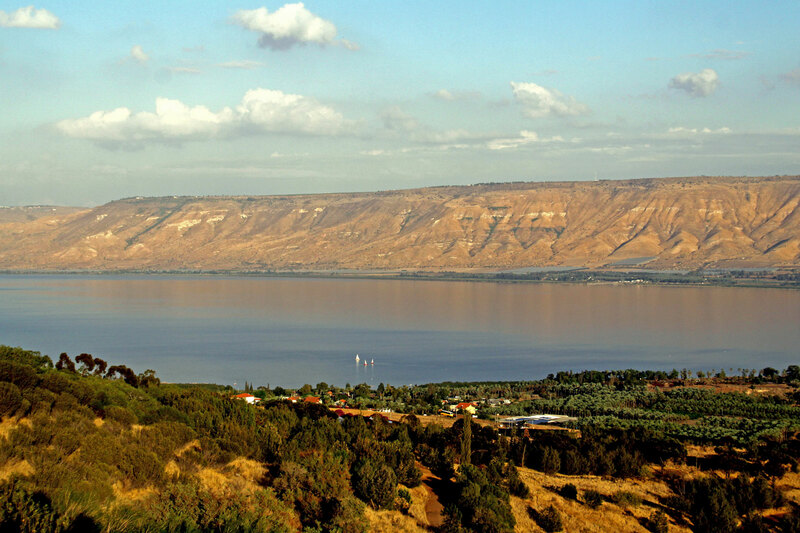 From the Mitzpe Hashalom (Peace Vista) enjoy the panoramic view of the Sea of Galilee. Cross the Jezreel Valley, passing Megiddo, famed site of many historic battles, and from which the name Armageddon derives. Drive along the Mediterranean coast to Caesarea Maritima, the ancient harbour built by Herod the Great, where Paul defended himself before Felix, Festus and King Agrippa (Acts 23 thru 26). After lunch ascend Mt. Carmel and visit the Baha’i Shrine and Gardens. Time permitting, we will make our way to the heights of Mt. Tabor for a panoramic view of the Jezreel Valley before returning to Galilee. cities. The fortress has a completely preserved Herodian structure, identical to the vanished Jerusalem Temple. Spend time with the Christian Peacemaker Team to hear of their efforts towards peace and reconciliation. After lunch, we will visit Shepherds’ Field and then visit one of the Israeli Settlements in the West Bank to hear a presentation about their situation. If possible we will arrange a visit to Gush Etzion in order to hear Ali Abu Awwad speak about "The Palestinian Israeli Initiative for Understanding, Nonviolence and Reconciliation". We shall also arrange to meet with “Combatants for Peace”. acting pastor and acclaimed writer and director of Dar Al- Kalima consortium, to discuss the Living Stones. Tour the college and the cultural centre that he established in an effort to help meet the cultural and educational needs of the Palestinian community. After lunch, visit the remains of King Herod’s fortress, Herodium, and the Palestinian Heritage Centre, with its wonderful assortment of traditional crafts, and meet with its director, Mrs. Maha Saca. Our day begins on the Mount of Olives with the Old City spread out before us. Enter the courtyard of the Church of the Pater Noster, one of Helena’s four earliest churches. 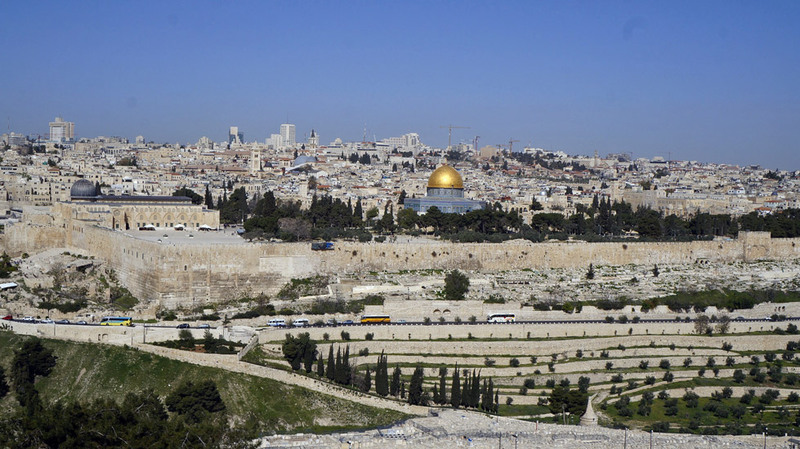 Follow the traditional Palm Sunday route, stopping at the Dominus Flevit Church to view the Temple Mount Golden Gate. Visit the Garden of Gethsemane, the Church of All Nations for a moment of quiet and the Tomb of the Virgin Mary (the Tomb of Crusader Queens). Drive down the Kidron Valley to the City of David and walk through recent excavations from the First Temple period to the Gihon Spring and the Pool of Siloam, ancient Jerusalem’s complex water system. Drive to Mt. 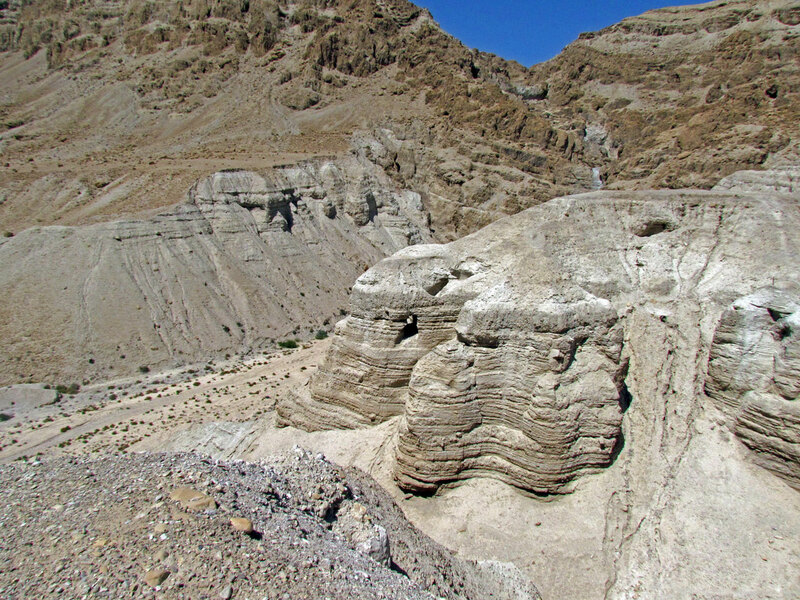 Zion, and visit the Upper Room and the Church of St. Peter in Gallicantu, the location of the High Priest Caiaphas’ Palace. Entering the Old City by the Lion’s Gate, we see the Pools of Bethesda (John 5:2-9) and perfectly preserved St. Anne’s Church. We follow the Way of the Cross, or Via Dolorosa, pausing to visit the Sisters of Notre Dame de Sion located by the Ecce Homo Arch. We will see the Lithostrotos, where Jesus suffered at the hands of the Roman soldiers, and where the trial by Pontius Pilate took place. We then continue through the old city as far as the Church of the Holy Sepulchre. 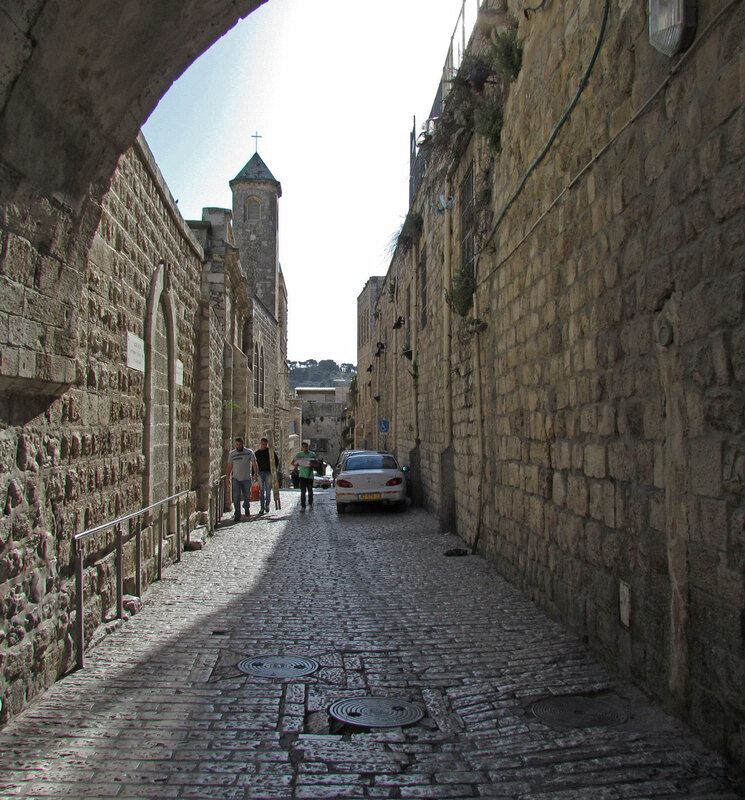 Walk through the Christian quarter toward Jaffa Gate and the Citadel. There will be free time this afternoon to explore the old city on your own or alternatively, those interested can visit the “Hand in Hand” School. and the last stronghold of the Jewish revolt against Rome. Continue to Jericho, the world’s oldest city, viewing the Mount of Temptation from the ancient Tel. 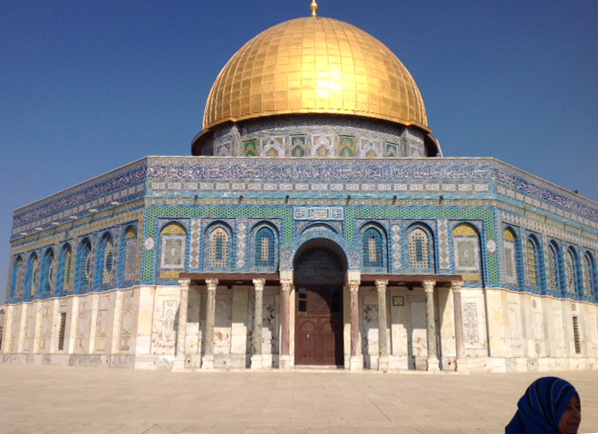 Our day begins with an early morning visit to the Temple Mount (if possible). Just inside the Dung gate, visit the Jerusalem Archeological Park to see the ruins where Jesus taught and walked. Continue to the Western Wall, one of Judaism’s holiest sites, and the Western Wall Tunnels to the streets of the Second Temple period. After lunch, we will visit the peaceful Garden Tomb. Finally enjoy a discussion at Sabeel Ecumenical Liberation Center about the realities facing the Christian community and the wider Palestinian community, to help better understand what it means to live under occupation, and how there can be hope for a future of justice, peace and reconciliation. Today has been left completely free, allowing plenty of time for you to explore this amazing city as you see fit. 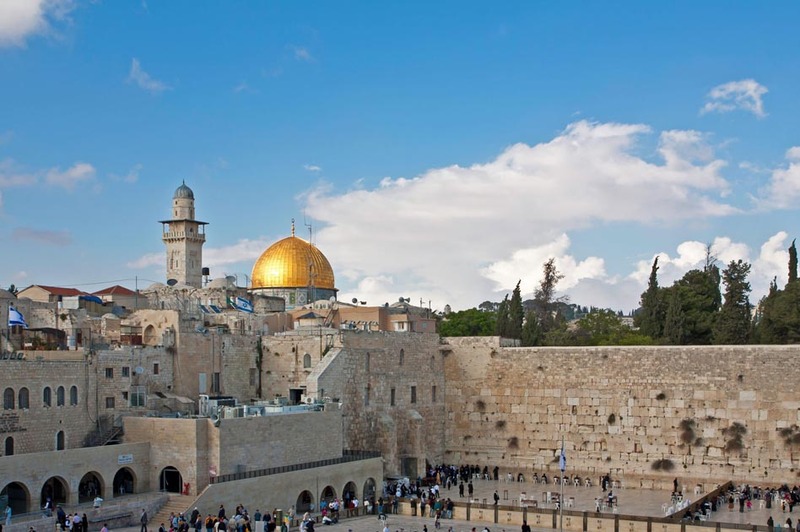 Discover the Old City of Jerusalem, taking time to visit the Church of the Holy Sepulchre or to visit the uniquely different quarters of the Old City: - Jewish, Armenian, Christian and Muslim sectors. You can even walk the walls of the old city and visit the Tower of David Museum in the Citadel for a detailed history of the city. We get together tonight for our farewell dinner. This morning we transfer to Tel Aviv’s Ben Gurion Airport to catch our Air Canada flight back to Toronto. Prices are based on a minimum 20 members and on rates, taxes and fees effective June 2018. Prices are subject to change due to factors beyond our control. Airfares from other gateways are available on request. Airfares and airline are subject to change and will be confirmed prior to final payment. Refer to inclusive features for details. Prices DO NOT INCLUDE the cost of insurance which is available and is highly recommended. Premiums vary with the cost, length of the trip, and the traveller’s age. For passengers up to and including 74 years on departure date, premiums will range from $278 to $450 pp plus applicable taxes. Cost supplements for travellers aged 75-85 will range from $196 to $414 pp plus applicable taxes. This insurance is effective from the date of purchase and carries limitations on pre-existing medical conditions. Clients 86 years and older and/or clients residing outside Ontario, please contact our staff for procedures. Please discuss your insurance coverage prior to booking. Refer to our Terms and Conditions for more details.